As President Donald Trump arrived for a 17-day “working vacation” at his golf club in New Jersey, Russian President Vladimir Putin was photographed fishing shirtless while on a mini-break in southern Siberia. 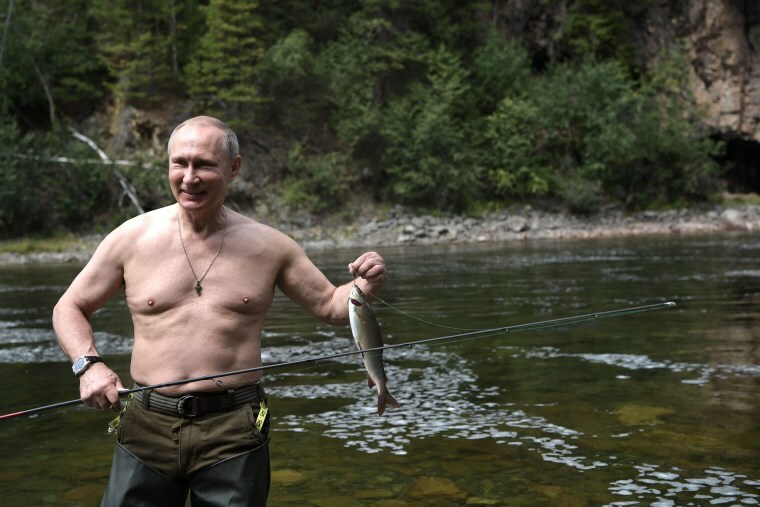 Photos released by the Russian Government show a bare-chested Putin successfully hooking several fish in the cascade mountain lakes this week. In one photo Putin, who is dressed in khaki army gear, is shown kayaking across a lake. In another he is pictured in the water wearing a full diving suit and clutching a spear. It is not the first time the Russian President has released photos of himself partaking in manly pursuits in an effort to push his strongman image. In the past the Kremlin has released pictures of him clambering over snowy peaks, lifting weights and practising judo. Russian Defense minister Sergei Shoigu accompanied Putin on his adventure. The pair are pictured lounging back in the sun, fishing shirtless together and admiring the flora and fauna whilst out walking in the southern Siberian countryside. The Russian and U.S. presidents set off on vacation after what has been a grueling few days for Russian-American relations. Trump signed a bill on Wednesday imposing new sanctions on Russia, putting to rest questions about whether he would support the legislation passed overwhelmingly by Congress last week. The bill sanctions Russia — citing its cyberhacking as well as aggression in Ukraine and Syria — while also slapping new sanctions on North Korea and Iran. Russia’s prime minister said Wednesday that the sanctions were tantamount to economic war on his country. "The hope that our relations with the new American administration would improve is finished," Dmitry Medvedev said Wednesday on his Facebook page.